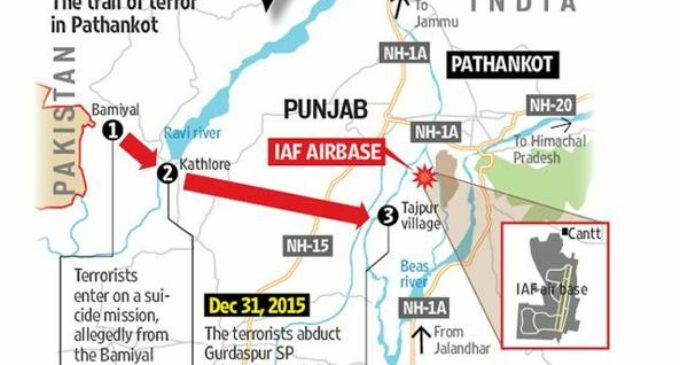 New Delhi, Jan 09 (Punjab Mail USA) – Hours before the long gun battle began at the Indian Air Force air base in Pathankot, one of the terrorists named Nasir called his mother in Pakistan and told her he was on a fidayeen mission. “Host a lavish party,” he said. He wanted his ‘martyrdom’ to be celebrated and informed his mother that she would get a call from ‘Ustad’ once he had attained it. The terrorists had no confusion. They were crystal clear about their task and had come prepared to turn their bodies into missiles. Unlike the six terrorists who managed to breach the high-security air base despite concrete and credible intelligence that came from Pathankot’s Superintendent of Police (SP), Salwinder Singh, the security establishment was far from prepared for the deadly assault. At first, the Border Security Force (BSF), which guards the international border between Punjab and Pakistan, had no clue that a heavily armed group had infiltrated into India. Even after they were accidentally — and providentially — discovered, the terrorists, armed with assault rifles, were mistaken to be robbers. It is not often that intelligence comes knocking on the front door. Before the Mumbai attacks in 2008, intelligence agencies had failed to join the dots despite ‘Taj Hotel’ appearing in several intercepts, but on the night of December 31, barely an hour before the dawn of a new year, the terrorists came face to face with an SP rank officer in Pathankot. He was blindfolded and thrown out of the car before the terrorists fled in his blue-beacon XUV. The information provided by the controversial and colourful SP Salwinder Singh was, however, dismissed by his seniors, who thought he had probably partied too long. Even after he was finally taken seriously, the Indian security establishment was unclear of where the terrorists would strike or how many they numbered. By late morning on January 1, it was clear that the first day of the new year was signing in with a terror imprint: Innova driver Ikagar Singh’s body was found with his throat slit. Salwinder Singh’s Mahindra XUV was tracked to just outside the air base and his jeweller friend Rajesh Verma too had checked into a hospital with a gash on his throat. Phone lines started buzzing between Delhi and Pathankot, between Jammu and Udhampur, where the army’s Northern Command is based, between Chandigarh, which headquarters the Punjab Police, and Chandi Mandir in Panchkula, where the Army’s Western Command is headquartered. And between the Prime Minister’s Office and Manesar, where the elite commandos of the National Security Guard (NSG) are based. The country’s security establishment was on high alert and defense establishments in Pathankot were asked to activate their quick reaction teams (QRTs). Soon, it also became known that the terrorists had an unmistakable Pakistan connection. They had made the cardinal error of using the phones that they’d snatched from Ikagar and Rajesh. The intelligence agencies had intercepted vital inputs: conversations between the terrorists and their handlers and Nasir’s farewell call to his mother. In one call, the handler reprimands the terrorist for sparing the SP and in another, he can be heard telling one of the terrorists that one group has moved ahead.